The installation of the Katherine Esterly Organ began on Monday, March 7, 2016. CLICK HERE to see photos of the installation and learn about upcoming events on our Katherine Esterly Organ Facebook page. CLICK HERE to see the TONAL SPECIFICATIONS of the new organ! PHOTOS: The Dedication of the Katherine Esterly Organ, February 19, 2017. As many have experienced, the music at the Episcopal Church of Saints Andrew and Matthew, during the services and at special events, is well known to lift the spirits and nourish the souls of those in attendance. However, the organ reached the end of its useful life cycle several years ago; in its place currently is a temporary electronic organ. After a lengthy in-depth process of research and evaluation, the Organ Committee at SsAM developed a plan for rebuilding and improving this 60-year-old organ. Quimby Pipe Organs, Inc., specializing in organ designs closest to the unique musical needs of parishes, was selected. They were also chosen because they best understood SsAM’s philosophy as well as our desire to incorporate pipes from the three former parishes that have consolidated into one… St. Andrew’s, St. Matthew’s and the Cathedral Church of Saint John’s. This renovation has improved the organ’s sound and will maintain the instrument for years to come. An enhanced organ honors the excellence of our choir and looks forward to the blending of young voices of the Cathedral Choir School of Delaware. Because of SsAM’s location in downtown Wilmington and its commitment to serving as a spiritual, cultural and social force in the community, the new organ will have an impact on music and culture far beyond the context of worship. Being particularly well designed as a bold concert instrument, it will also support the many groups that perform regularly at SsAM as well as attract additional musical groups. The new organ has been named after Dr. Katherine (Kitty) L. Esterly, a revered and honored pediatrician, a beloved and respected member of our congregation and of our state. She has been a major proponent of the new organ, understanding its importance to the congregation and the community. The organ was dedicated on February 19, 2017. WAS THIS A RENOVATION OR A NEW ORGAN? The SsAM organ project is a fairly radical renovation project that utilizes some pipe work from the organs of old St. Matthews and from old St. Andrews, which were both built by the M. P. Moller Co. in the mid-1940’s. 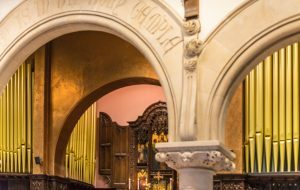 Essentially, a new organ is being built that meets all design objectives while incorporating historic elements of the two instruments: approximately 8 ranks of pipes from the St. Andrews organ and 4 ranks from the St. Matthews organ. There are a number of challenges in building an ideal organ for SsAM. Aside from the issue of finding the right design philosophy that can produce an instrument suitable for the wide range of musical styles suggested by the SsAM liturgies, the limited space requires that this be done with a limited number of pipes. With the current organ at 34 ranks, a new instrument housed in the same confined space would have difficulty providing the tonal and musical options that our parish needs. 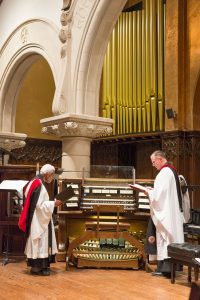 Although many congregations are now effectively solving this issue with digital instruments or by adding digital divisions, the Organ Task Force, as well as the SsAM Vestry unanimously agreed that our preference is for a custom built pipe organ. Another challenge was to find a builder who could embrace our unique musical customs and create a quality instrument that suits our space, musical requirements and budget limitations. Considering the space limitations as well as challenges with regard to design strategy, some creative solutions were needed to fill such a tall order. Many excellent designs were submitted by some of the leading organ builders, but Quimby Pipe Organs, Inc. of Warrensburg, Missouri was chosen as the builder. Michael Quimby and his outstanding staff in collaboration with SsAM’s music director David Christopher have developed what we believe to be the perfect instrument for the church. With the addition of a new organ chamber, increasing the size of the new instrument to 45 stops and using the most modern technology, David and Michael have devised a visionary instrument that we believe will meet all of the parish’s musical and liturgical needs. The design strategy has at it’s core a classic instrument with well developed choruses of sound. However, the addition of a few orchestral stops as well as placing the three main divisions under expression (Great, Swell and Choir) will expand the musical options beyond the scope of most traditional mid-size organs. The new instrument with be particularly strong at supporting congregational singing, accompanying a wide range of choral repertoire, facilitating inspiring improvisations within the context of liturgy, providing continuo for early music, and serving as a dynamic and inspiring recital instrument. In other words, the new SsAM organ will “step out of the box” much the same way that our parish in known for stepping out of the box spiritually, socially and liturgically. Click here to learn more about QUIMBY PIPE ORGANS, INC.
Perhaps the most important aspect of the new organ is that it serves as a symbol and critical milestone in the evolution of the parish. By taking the strongest elements from the organs of the two historic parishes of SsAM (St. Matthews and St. Andrews) and weaving them into a new and visionary entity, we give credibility and a sense of permanency to the successful union of these two churches. The project is enhanced with the addition of pipes from the Cathedral Church of St. John’s. Every time the new instrument is used in worship or in concert, our hope is that it will serve as a reminder that God’s will can be realized against all odds. In our case, this means defying all of the statistics that surround the viability of creating a parish such as SsAM; one that is radically welcoming, yet intentionally diverse. It also means finding a new way to stay faithful to the principles behind traditional values, but in a way that allows the Holy Spirit to help us evolve into a community that is alive and relevant to the world today. The most significant change to the architecture of the sanctuary was the addition of a new chamber in the front of the church directly behind the where the choir sits on the pulpit side of the nave. As a result, the front of the church has a stronger sense of balance with matching pipe facades on both side of the room. According to SsAM’s architect, Lee Sparks (Design Collaborative, Inc.), the addition of the second organ chamber is not only an inevitable improvement because of its beauty coupled with functionality, but it completes the architectural balance of the room in a way that stays true to the spirit of original (historic) architectural concept. In the rear gallery of the church, attractive pipe work around the central round window replaces the former facade, but the basic layout (of the antiphonal organ) is very similar to the original design.